SHE’S known across the land as Sister Bernadette – but Call The Midwife star Laura Main has turned into a princess. The Aberdeen-born actress is now playing Princess Fiona in Shrek The Musical, and loving every minute. “People that watch Call the Midwife find it hard to believe it’s the same person,” she admits. 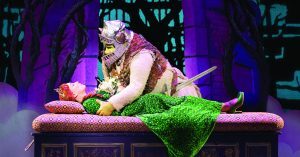 Shrek The Musical will be at the New Victoria Theatre, Woking, from Wednesday 30 May until Sunday 10 June.